July saw the return of two of our previous pastors. 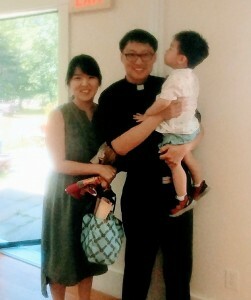 Seongmoon Ahn and his family returned to celebrate his ordination with us, his first congregation. Sien and Soyune have a new brother since living in Chilmark. Hasty photo doesn’t do them justice. Arlene Bodge joined us for worship another Sunday and the congregation was thrilled to see her well there as well as at the sunset worship service in Oak Bluffs that was part of the youth camp meeting that weekend. We’ve been blessed with these lovely leaders! This entry was posted in guest preachers on August 6, 2018 by admin.